With the softness and warmth, the Slate Canyon basement interlocking tiles give you are creating a home feel basement that family members can enjoy! 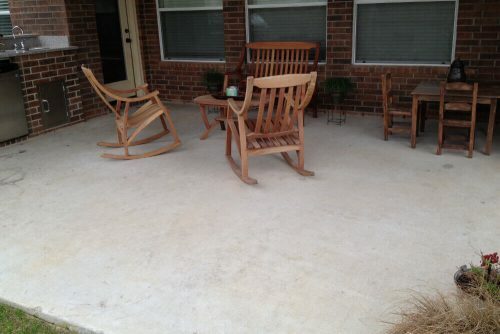 Simple to install, durable, aesthetically pleasing, and also a comfortable surface for walking. You may install the basement tiles over chipped or uneven concrete. It may also be installed over any flat surface, including carpet, vinyl or concrete. With an edge-to-edge quality, these interlocking tiles include a do-it-yourself interlocking system, so each tile snaps together to form a beautiful finished floating floor. Underneath the attractive vinyl surface lies a polymer base for supporting large, heavy objects. This foundation is constructed as a grid layout, allowing air to flow through and creating a thermal barrier for comfort. 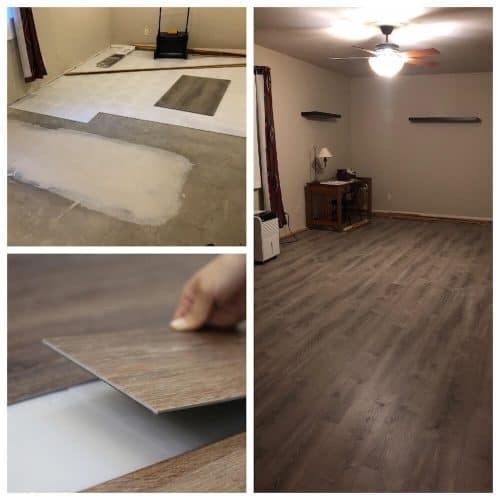 The following explains in further detail all the benefits the Slate Canyon tile has regarding basement flooring and its convenience. The Slate Canyon basement floor tiles measure 12 x 12 – inch (1 square foot) and are lightweight which helps speed the process of installation. When trying to figure out how many tiles are necessary for the basement, you first need to know the entire square footage of the area. The square footage amount will be equivalent to the number of tiles required. However, if having to cut around any permanent objects, stairways or walls add about 6% to the total amount of tiles required. The additional tiles will account for the waste. The Canyon basement interlocking tiles can easily be cut with a jigsaw (fine tooth blade), to accommodate to the size or shape needed. The only small preparation required before beginning your installation is to simply sweep your base floor clean of any dirt and debris. With a four loop-to-peg interlocking system, each vinyl top tile snaps together with a downward push and disassembles by intentionally pulling them apart. 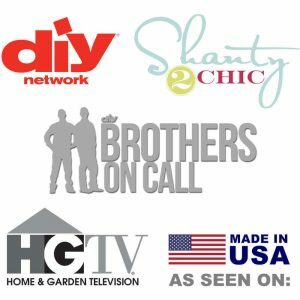 Professional help nor professional tools are needed for this DIY project. If covering a large basement area, you may want to consider using a small plastic mallet and knee pads to ease the process. Once these tiles are locked together correctly, they form an edge-to-edge appearance due to the tiles’ straight-edge quality, forming a gorgeous finished floating floor. The basement tiles have small gaps between each other to allow the moisture to escape from underneath. The Slate Canyon interlocking basement tiles are resistant to fading and staining, due to its colorfast and UV protection. The vinyl composite surface can handle the average walking traffic a basement is. Beneath the vinyl, surface is a base composed of high-impact polypropylene. The polymer base is rigid and strong in order to support considerable weight found in a basement. 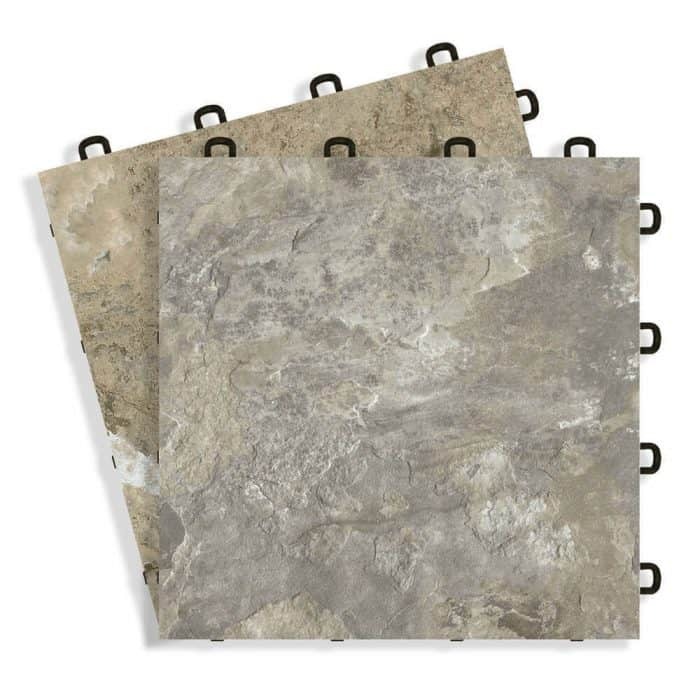 These interlocking tiles are suitable for pool tables, entertainment areas, etc. However, this vinyl top tile’s durability doesn’t only lie within the polymer base, but also in the vinyl top itself. Despite the durability, it is essential to maintain the surface of the tile. To clean you may use a Swiffer or water and mild soap for the surface. By doing so, you will prolong the life of the floor. 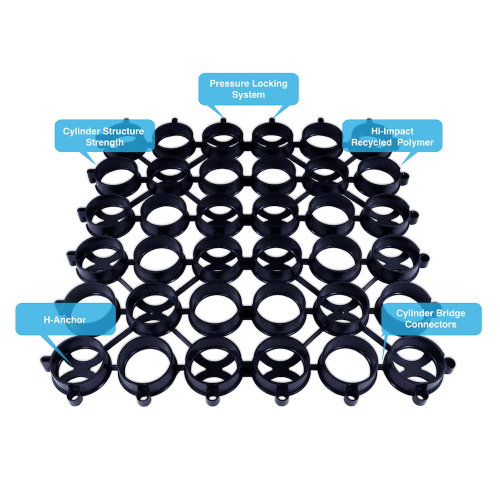 In addition to the nonporous vinyl composite material, the foundation of each vinyl top Slate Canyon basement interlocking tiles are manufactured with a mold-resisting plastic known as polypropylene. 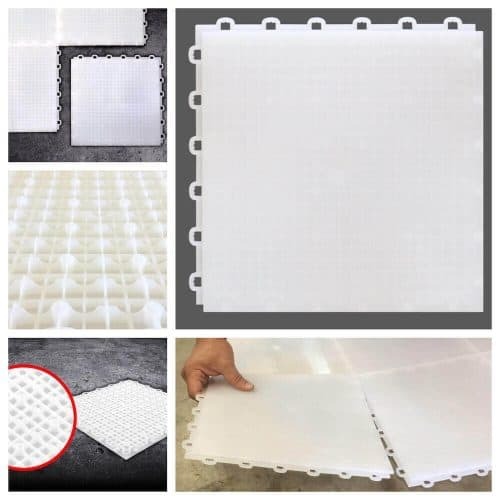 Furthermore, the antimicrobial polymer foundation is constructed in a grid layout to allow air to circulate through grooves while letting moisture and humidity escape. 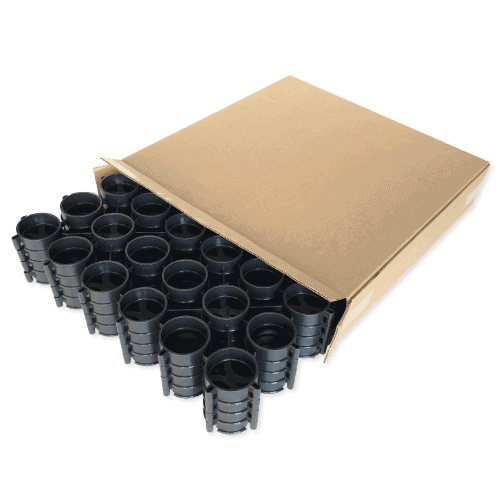 This ventilation system helps prevent microorganisms from developing on the tile and base floor. 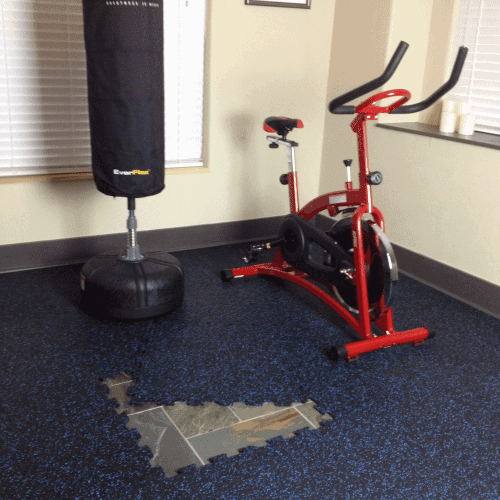 The Slate Canyon basement interlocking tiles are undoubtedly an excellent solution for basement flooring. Their lightweight, attractive surface, durability, and ease of assembly and disassembly make these vinyl top tiles versatile. All these beneficial qualities make them a great flooring solution for other uses as well. 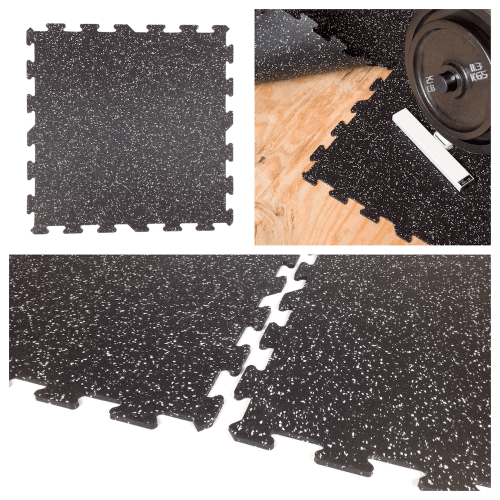 Whether they are installed for temporary office flooring, commercial displays or travel from trade show to trade show, the Slate interlocking tile is built too last. Your next basement-flooring project can be completed quickly and effortlessly. Buy them today! Just add them to the cart and proceed to the checkout page. Feel free to browse ModuTile Basement Flooring – section to view our other interlocking tiles suitable for a basement flooring option. As always, if you have any questions please feel free to call us at 713-663-6060. So far I am very happy with the floor. It was easy to install and contoured to the uneven cement floor. 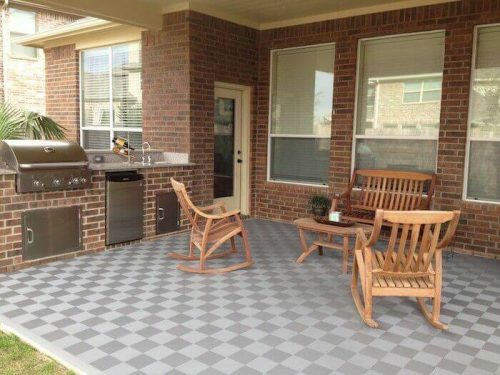 It looks like real tile. It was installed in a mudroom so the real test will be if it survives a New England winter. We haven’t had much snow yet but it’s held up pretty good so far. Just finished our basement room and closet with the “Cream Pearl Canyon” ModuTile. Our basement stays dry but we had issues with the carpet pad not breathing enough and caused the carpet to mildew. ModuTile was a great solution and was very easy to install by ourselves over the weekend. I cut all of the tiles using a foot shear in my shop, except for a few jamb cuts where I used a jigsaw. Our basement no longer smells like a basement again. :) I would highly recommend this product to any of my friends or customers. Sending a picture of my new craft area. As you can see, the tiles look great. Other areas that we did was the laundry room and a large storage area. We are so please with the outcome. Thanks again. Your company was wonderful to deal with and I certainly would highly recommend you. The order was delivered within two weeks and I installed the tiles in two rooms and a closet over two weekends. I just followed your online instructions and was ready to go. I did have cuts to do which does slow down the process but not a big deal. I found that your cuts are more accurate if you cut the tile from the top and use blue painters tape so that you don’t mark up the tile with the jig saw. Worked OK.
Also I did have to trim the bottom of three doors maybe an eight of an inch but again not a big deal. Once all the tile was down I installed new trim molding on the sides and the radiators were already raised so that the tile would slide in. Attached are a few pictures. Overall this is an easy install. Friends of mine have already commented on how good the floor looks and I would highly recommend this type of flooring.